Do Children Need Corrective Footwear? It has been our experience that proper care and treatment of the feet, beginning in childhood, will prevent many of the mechanical and orthopaedic problems seen in adults. Many children walk excessively pigeon toed, flat footed, or bowlegged. Although they are not in pain, they are damaging their feet. For years, specially designed shoes for children have been recommended in cases of flat foot (poor development of the longitudinal arch) and in-toeing. Both of these conditions are noticeable when a child first begins to walk. After several years (usually when the child reaches 4 to 6 years of age), parents become concerned and bring the child in for an evaluation. We now understand the natural process of foot development much better and can make specific recommendations in such cases. Flat Shoes - avoid raised heels to ensure proper weight distribution, promote proper posture, and prevent toe cramping and deformity. Flexible sole - stiff soles limit the movement necessary for developing normal foot strength and mobility. Light and porous upper - allows the foot to breathe to help prevent foot infections. Also avoid excessive weight from the shoe material. Nonslip soles - to reduce the potential for falls and injuries, avoid soles that are too slippery or too sticky. Shoe appearance/cost - final considerations should be whether the shoe is acceptable to the child, and fits into the family budget. 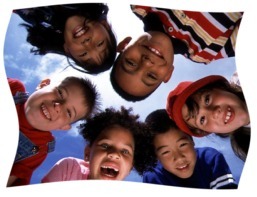 Click here for further information on choosing children's footwear. 1. Flat feet - Many babies naturally appear flatfooted. Usually, this will disappear as the baby begins to stand and walk. The longitudinal arch normally develops during the first six to 10 years of growth. Children with flat feet, or low arches, may not be able to keep up with other children because of the added strain on feet and legs. The reduced incidence of flatfoot seen in barefoot populations suggests that muscle strength and mobility may be important factors in the normal development of the arches, and that a child is more likely to develop a flexible, yet strong arch when going barefoot. We need to encourage parents to let their children go barefoot whenever it is safe, and to select shoes based on function, not merely on style or cost. The tendency to develop flatfoot is inherited, and the source of many kids' flat feet can be traced to a parent or another relative. In these cases, it is especially important for the child to spend considerable time barefoot. When this cannot be done safely or regularly, custom-made, flexible orthotics should be considered. 2. In-toeing - Most babies begin life with their toes point slightly out. However, if the unborn baby lies with its feet pressed against the womb the wrong way, it can be born with its feet turned inward. 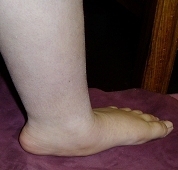 The condition can make learning to walk difficult. Tripping may be the first sign of toeing in. This condition has been referred to as the most common complaint associated with gait in children. Historically, shoe modifications (such as wedges and special lasts) have been prescribed for correcting the lower-extremity rotational problems that cause in-toeing. Studies over the past several decades have shown that such interventions have no significant, predictable effect on kids with in-toeing. Exercising the involved external rotation muscles (to accelerate normal developmental rotation of the leg) may be useful, but has not been tested reliably. At this point, the best recommendation for most children is to wear good shoes, and to focus on sports and activities that develop balanced leg muscles. Also, toeing-in can often be corrected through stretching exercises that can help straighten out a baby's feet. The exercises take minutes a day, and they are performed until the problem is corrected. In some instances, plaster casts can be used to coax a baby's feet back into normal position. Just as braces gradually reposition teeth, casts gradually reposition feet. The casts are changed periodically until the podiatrist determines that the feet are properly aligned. For the vast majority of children, special shoes are not necessary. Currently, "corrective" shoes are seldom prescribed, and are only considered necessary when a significant gait problem cannot be resolved by wearing good shoes and using the leg muscles in regular activity. The major hallmark of a good shoe is a flexible sole. In fact, the best shoes for children are those that come close to allowing the foot to function as if it were not in a shoe. This means there needs to be sufficient room for the toes (plenty of length) and for the forefoot (plenty of width). An unusually "supportive" or restrictive shoe is not needed, and may hamper the development of normal foot biomechanics. Of major concern are youth versions of adult sports shoes - their thick, rubberized soles are often extremely inflexible, and may interfere with the normal growth of the arches of the foot. Another common problem is seen in the "dressy" shoes for girls. Elevated heels, pointed toes and small sizes all contribute to future foot problems. 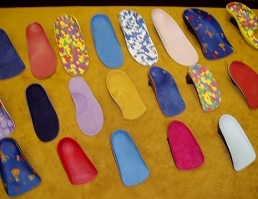 Children do not usually need custom orthotics until about the age of 6. If a child is still not developing a normal arch at that point, or if in-toeing persists, orthotics may be needed. This is particularly true when the child is involved in athletics and sports activities. In these cases, custom-made orthotic support for the arches can improve gait and running performance significantly; otherwise, many children are well-served by wearing sensible, flexible shoes. With more research and experience, we know now that there are only a few rare cases of children who need special "orthopedic" or "corrective" shoes. Most kids will develop healthy foot and arch alignment, as long as they are not forced into poorly fitted, inflexible shoes. In fact, children should be encouraged to spend as much time as possible barefoot. The main consideration when going without shoes is protection from cold, heat and injury. When shoes are required, the simple guidelines noted in the table above are sufficient to help parents select shoes that will not interfere with the normal development of their children's feet. In conclusion, orthotics may be helpful for children who demonstrate persisting biomechanical problems by the age of 6. Those who are active in sports or who demonstrate inefficient or awkward gait patterns are good candidates for custom-made, corrective orthotics designed to support the developing arches of the feet.